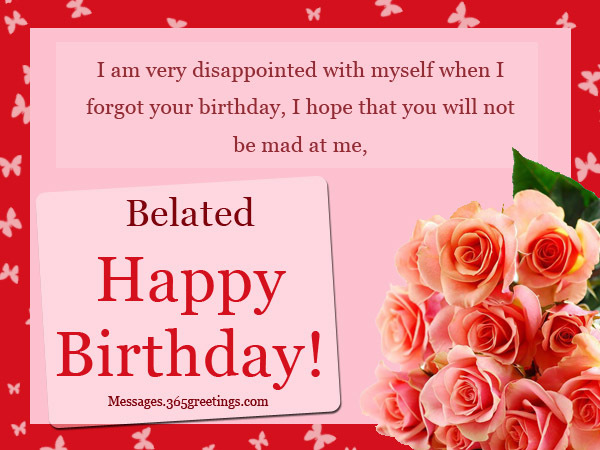 In sending or addressing late birthday wishes, you should show your sincerity to your mistake for being forgotten or being late to greet them. In order to prevent upset feelings, you should take the blame and responsibility for this. 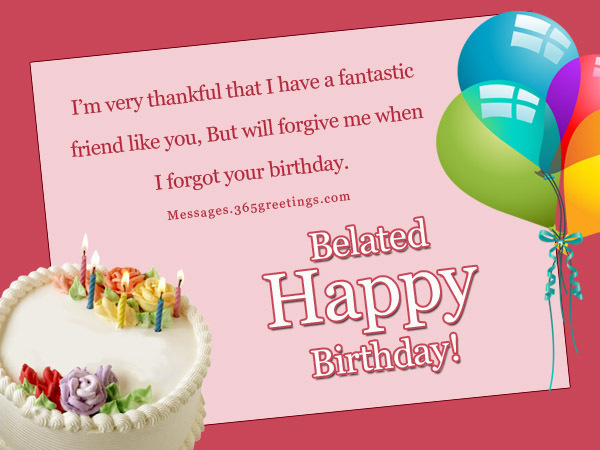 Choose those birthday messages that are suitable for them and to the situation. Here are some happy belated birthday wishes that you can use. 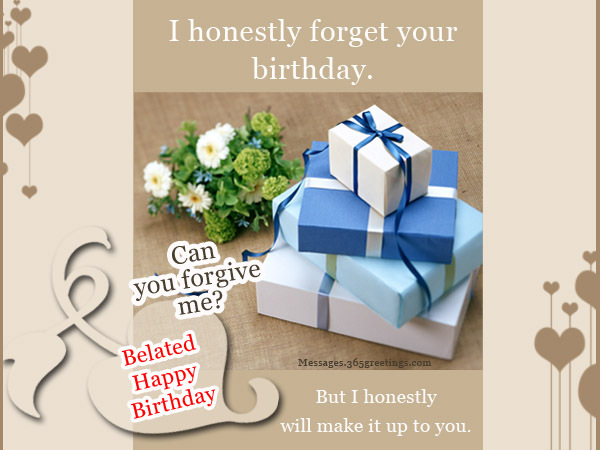 But will forgive me when I forgot your birthday. I think I should immediately see a memory-loss-sort-of-doctor. But before that, can you go with me first and let’s see a movie? But I remembered that time when you forget mine. I did not get mad at you. it doesn’t mean that you’re not special anymore. but to show you that there is no “late” or “early” in doing things for a special person like you. so that I will always remember that you’re still celebrating your birthday. I won’t be sorry because you know I already do. Just say to me how can I make it up to you? And being late makes it more special! Shopping, tour, salon, spa, food! What else? Let’s go! I’m serious. 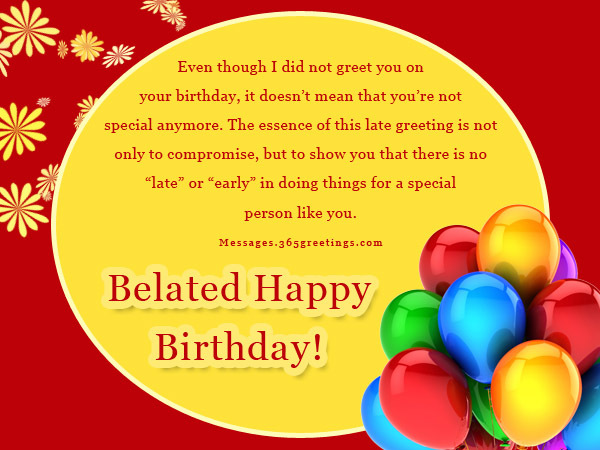 Wishing a person a Happy Birthday on his/her special day sends heartwarming feeling to the celebrant. But what if you forgot his/her special day? Don’t be depressed as you can always greet them – though it would be a belated birthday. 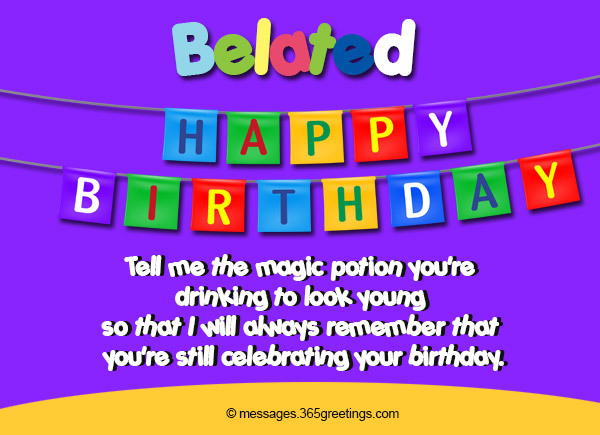 Here, we listed out some funny belated birthday wishes and birthday messages that you can use to greet your friends. 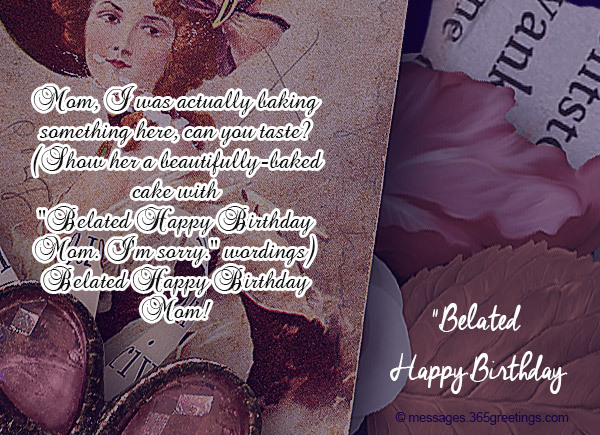 We also include some happy belated birthday greetings. I honestly forget your birthday. But I honestly will make it up to you. It wasn’t only your birthday. I also forgot to brush my teeth, eat on time, and sleep properly. It was a harsh corporate world. 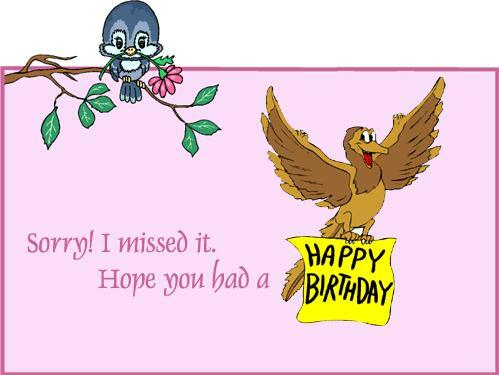 You remembered I forgot your birthday? It’s just that, I just want you to think of me even once. Because I have proven that I still cross your mind even for a second. You still care. Thank you. Mom, I was actually baking something here, can you taste? It’s never a sin to forget a birthday. But it will be one if I did not even greet you when in fact I have remembered it even it’s already too late. I would like to apologize for forgetting a special birthday of my special friend. 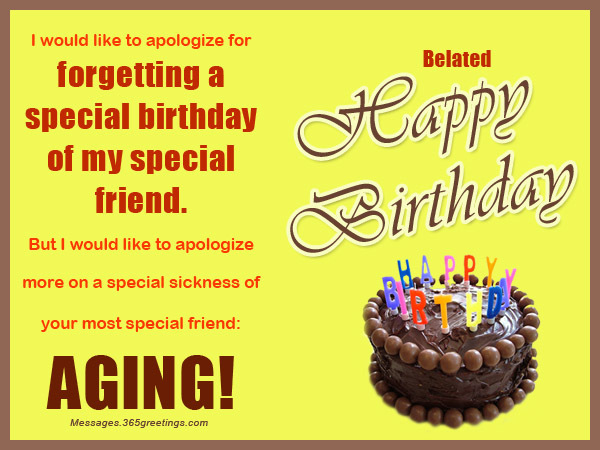 But I would like to apologize more on a special sickness of your most special friend: AGING! Because I’m just too early for your birthday next year. I was actually looking from a 2010 calendar! 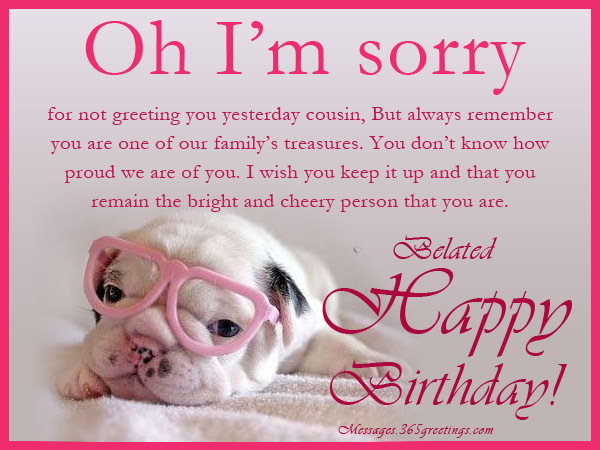 I’m sooo sorry, and belated Happy Birthday! 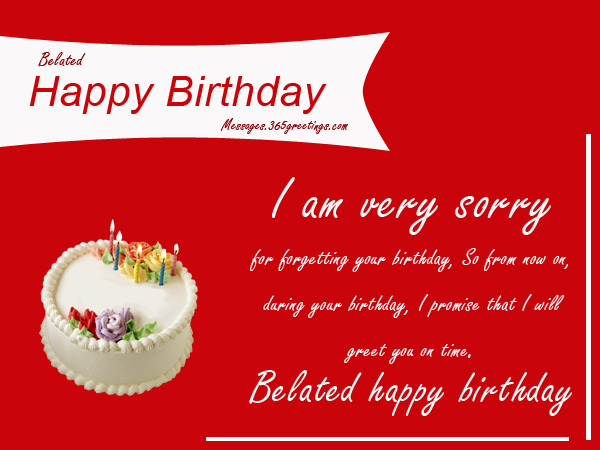 just do not curse me for forgetting your birthday my dear. I have been forgetting a hundred birthdays now. I understand if you would forget mine. I’m really sorry. But Still, Happy Birthday! I was actually preparing a very well organized date for you and your long time crush! Are you still getting to be mad at me now? exactly one day ago after your birthday. I did not even bother to greet you that time. You’re not even awake, right. Uhm, is this counted? 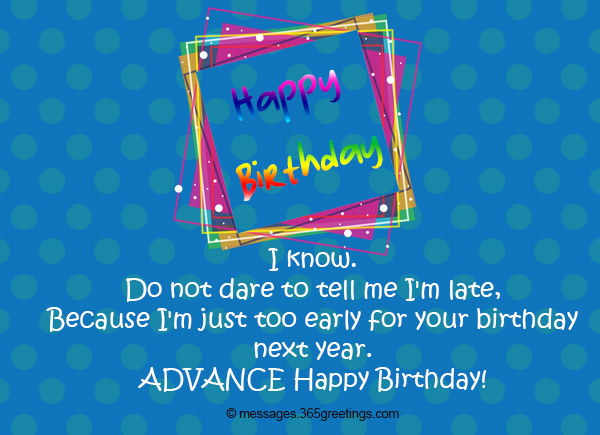 So from now on, during your birthday, I promise that I will greet you on time. 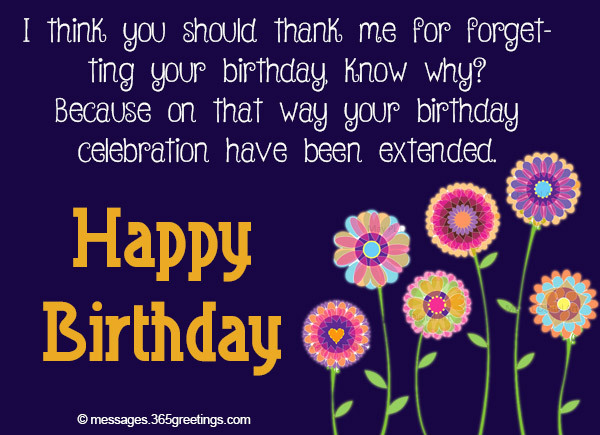 I think you should thank me for forgetting your birthday, know why? Because on that way your birthday celebration have been extended. 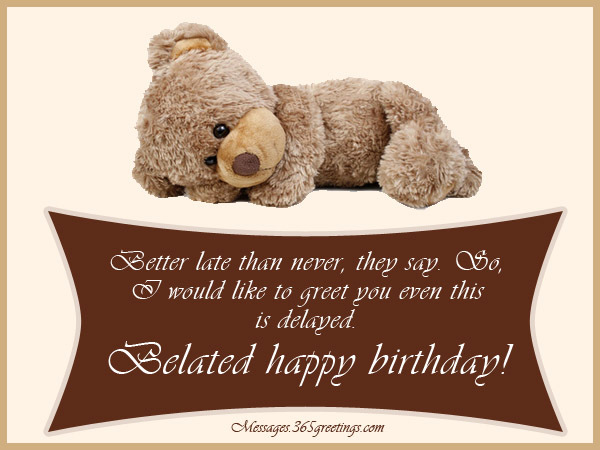 So, I would like to greet you even this is delayed. 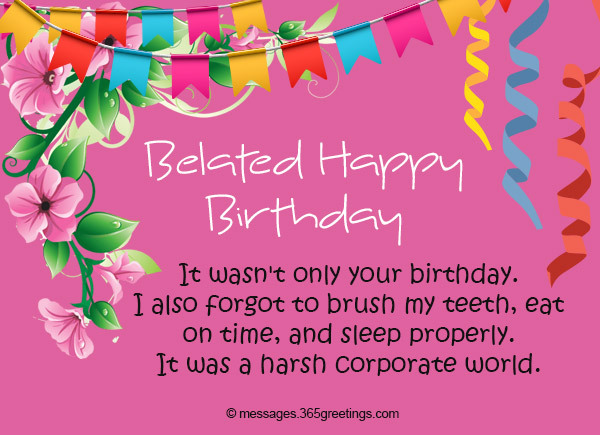 Here are some belated birthday wishes that are suitable for late birthday greetings to your cousins. Choose the best for them based on their humor, likes, attitude and others. 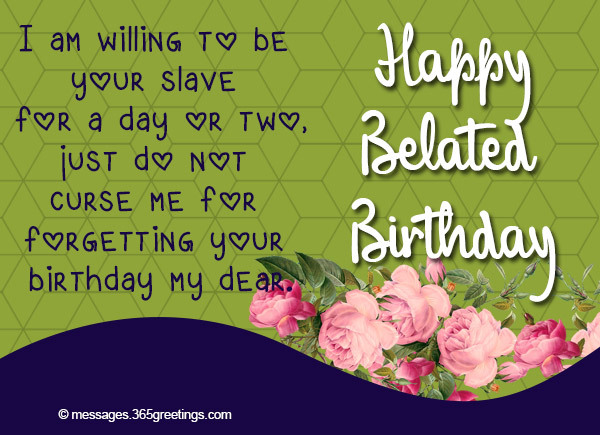 Saying personally is the best way to address belated birthday wishes to make it more sincere and appreciable. So I’m very sorry if I accidentally forgot that day. Still, I want to wish all than best for you. I regret that I wouldn’t greet you on that day. So now its time for me to greet you, have prosperous life. But always remember you are one of our family’s treasures. You don’t know how proud we are of you. I wish you keep it up and that you remain the bright and cheery person that you are. It’s never too late to greet a loved one a Happy Birthday. 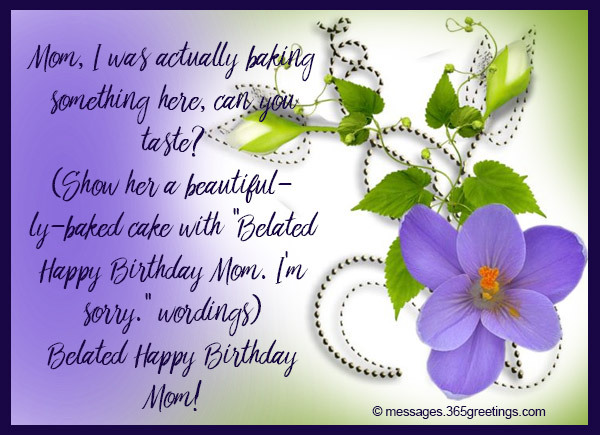 That’s why we listed out some inspiring and humorous belated birthday greetings and wishes for you to use. Let them know that even it’s late, you still remember his/her special day. Feel free to use these happy belated birthday messages and belated birthday wishes. Good Luck! I was so far away during your birthday, but you were on my mind. Hope you had a great time with family and friends. Happy belated birthday! 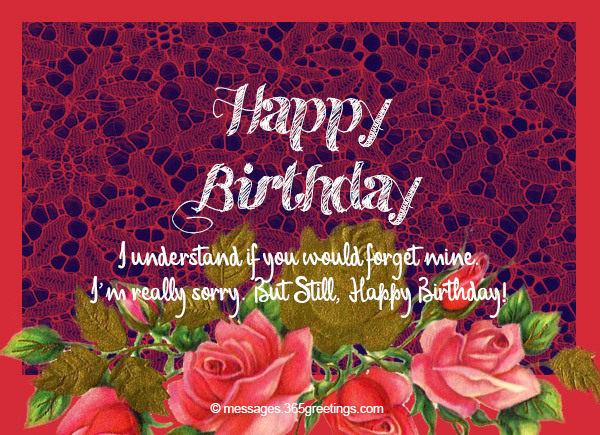 Even though I was miles away on your birthday, it is not to say that I do not care. Hope you had a memorable birthday. Happy belated! Happy belated birthday! I got too busy to be available on your birthday. 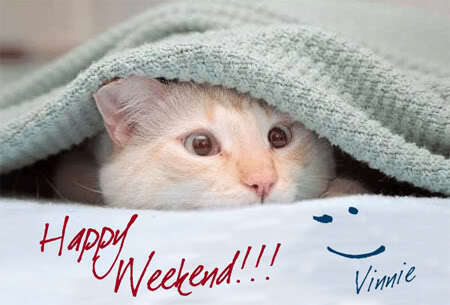 This is just to wish you everlasting happiness even in the days to come. Hope you had great fun on your special day. 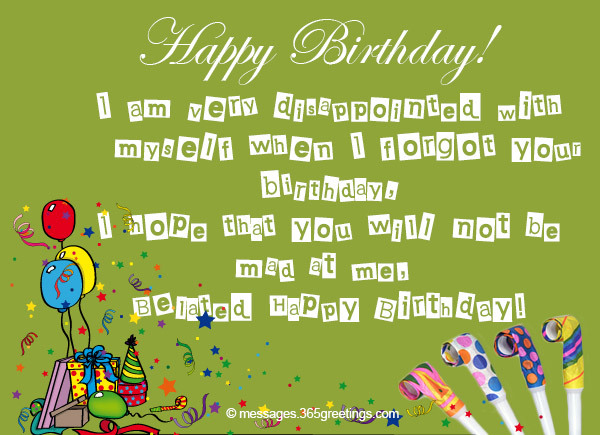 You were so busy with everyone; I hardly had the chance to wish you a proper birthday. 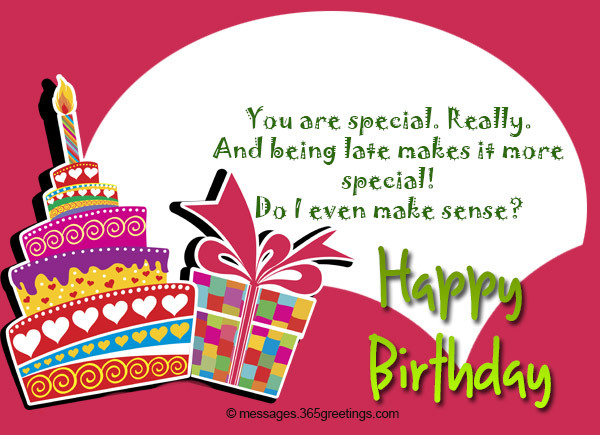 This is just to send you special happy belated birthday! 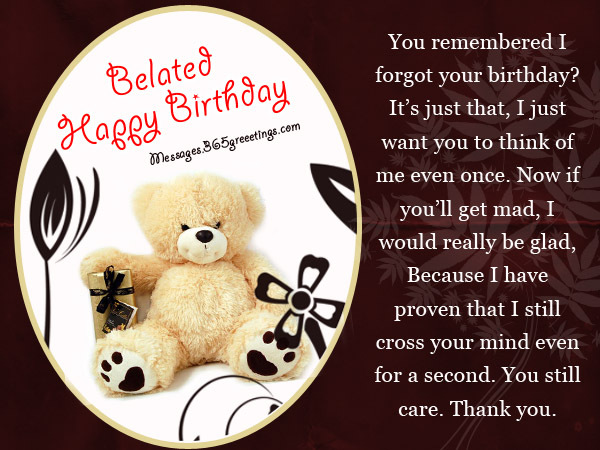 You are very special to me and even though I wasn’t there to give you warm birthday wishes; this is to remind you that I never stopped thinking about you. Happy belated birthday! The last few weeks, things became extra busy and time went too fast. Even so, you will always be the most important person in my life. Happy belated birthday! Though I missed your birthday party, I hope you had an incredible time. Happy belated birthday! Receive our belated birthday wishes. Kindest regards from the whole family. Time flies when you have your hands full. 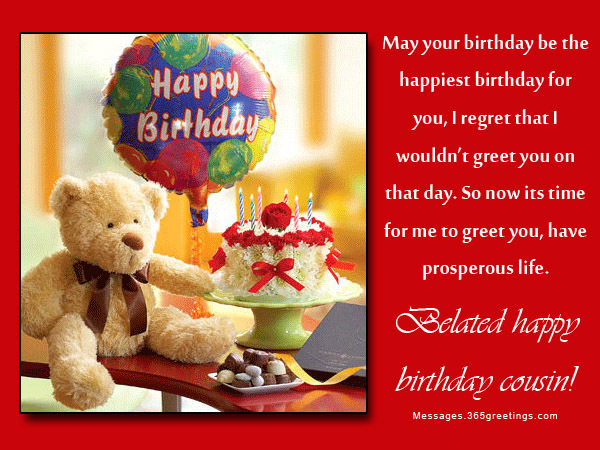 Before coming to see you and give you a special birthday gift; please receive my birthday wishes with lots of love. Happy belated birthday! I know my wish is coming very late, but better late than never – right? Wishing you all the happiness in the world. Happy belated birthday! Hey! It never hurts to celebrate your birthday twice. So why not have another day full of fun and excitement just to remember your birthday? Happy belated birthday! Hope that these greetings warm your heart and bring a smile on your face. Happy belated birthday! Don’t worry; my gift is not the type that expires. But before you receive it, hope you had a blast. Happy belated birthday dear! 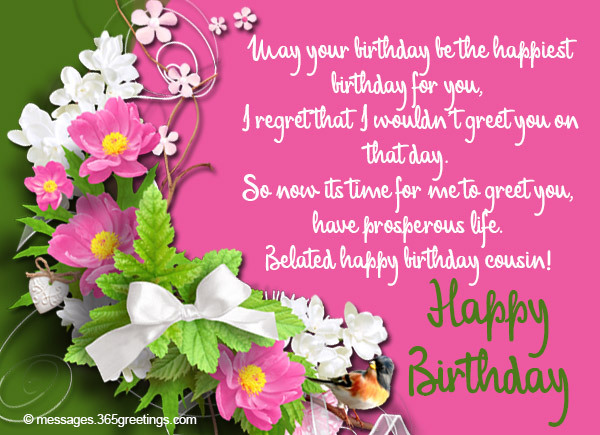 My belated birthday wish to you is that you will find success in all that you do in life. May the heavens show kindness to you in all the days of your life. Happy belated birthday! May you have an amazing year ahead and live to celebrate many more birthdays. Happy belated birthday to the most amazing friend I know.